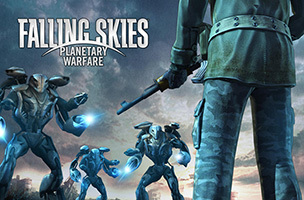 Little Orbit and TNT have announced the launch of Falling Skies: Planetary Warfare on iOS and Google Play, based on TNT’s television series Falling Skies. The strategy game throws players into a battle for Earth, choosing to side with the human resistance or the alien invasion. Falling Skies: Planetary Warfare is set after season three of the television show. Once players choose to side with the humans or aliens, they’re given a base to construct and protect, defending it from attacks from the other force, which is comprised of other real players. Like other “base-building” games, Falling Skies sees players constructing mines and farms to earn resources, in addition to sentry towers and other defensive structures to protect their base. Players build a barracks to recruit soldiers, and can take their military units into battle to destroy enemy bases and pillage resources from others. The game features both single-player and multiplayer combat. In single-player, gamers complete levels on a map, earning up to three combat ribbons on each stage, depending on their performance. Units are deployed by tapping and holding on the screen, and units attack enemy fortifications automatically. Multiplayer battles play out in the same way, but attacking another player lowers the first user’s shield, and leaves them vulnerable to attacks from others. “Falling Skies is a fantastic show, and we’re going to be exploring some fun storylines with the writers as the new season gets closer. This is a new opportunity for new and old fans to play a game that will evolve as the plot on television evolves,” Scott added. Falling Skies: Planetary Warfare is available to download for free on iOS and Google Play, and is supported via in-app purchases. A console game is being planned for release this Fall. Check back soon to follow the game on AppData, our tracking service for mobile and social apps and developers.